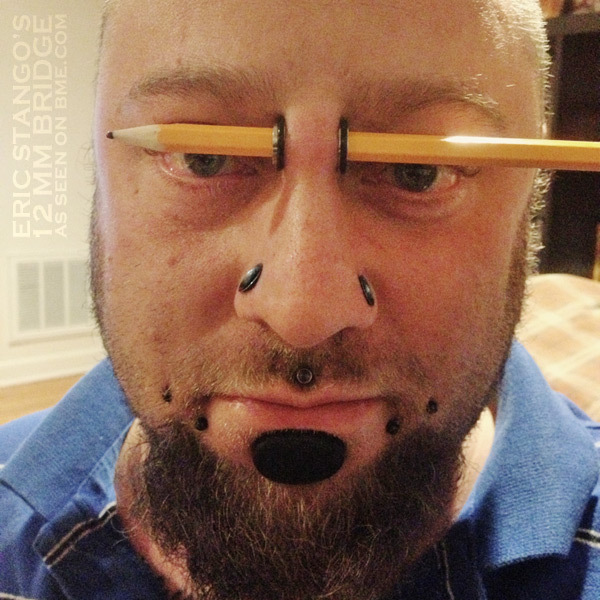 I’ve mentioned before that when it comes to bridges piercings, Eric Stango is my hero, but he’s topped himself today by this awesome orbital. 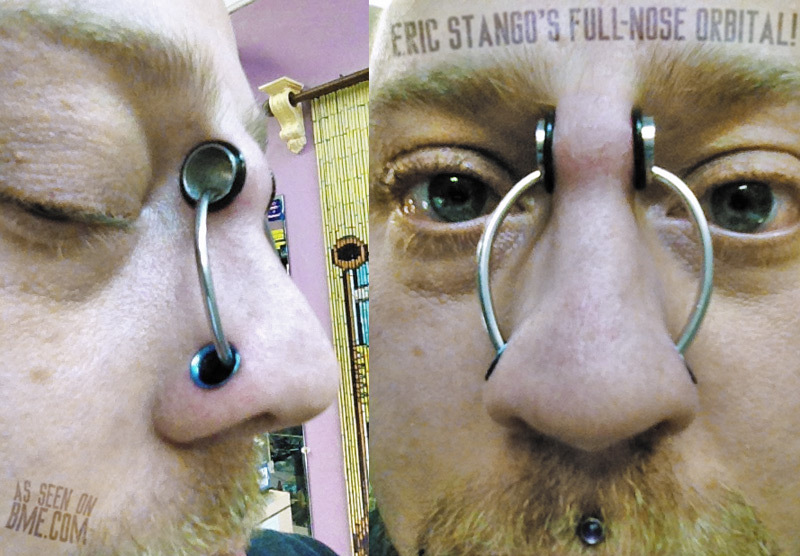 We’ve seen nasallang orbitals before, but Eric’s upped the ante with a full-nose orbital that passes through a pair of nostrils and a septum (ie. nasallang) as well as through his massive bridge piercing. 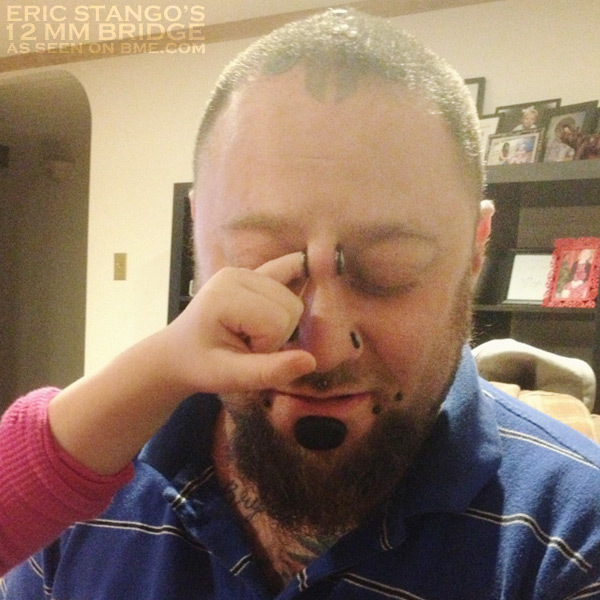 I’m quite certain that this is a first, so for now I dub this THE STANGO. There’s not much to see, but if you’re curious click here for an up-nose shot (he warns, “sorry about the copius amounts of nose hair… I’m Italian!”). 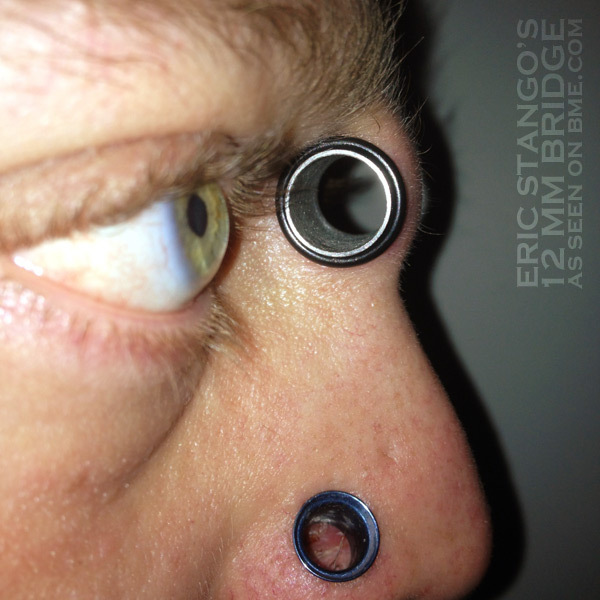 I posted Eric Stango’s bridge piercing a little while back when he was at a measly 00ga (you may also remember him from a couple neat piercing projects — a set of “whiskers” and an anthropomorphic ear piercing). 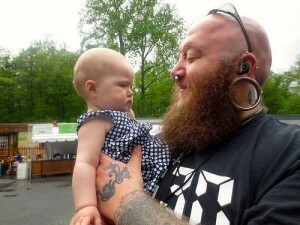 Since then he’s pushed it up to accept an impressive 12mm tunnel, just a sliver away from being an epic 1/2″ Erl. Here he is showing it off with some assistance of one of his four young apprentices (find Eric at Lifestyles and Krazy Eric’s in Connecticut). 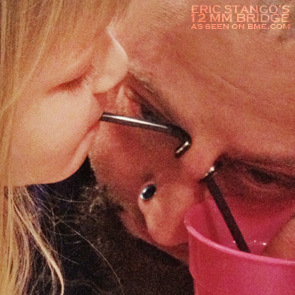 You may remember the name Eric Stango (of Lifestyles in Worcester) from a couple odd piercings from his portfolio that I’ve shared with you — the cat whiskers and the “climbing man” ear project — but today I actually wanted to show you the piercing that he wears in the middle of his face. 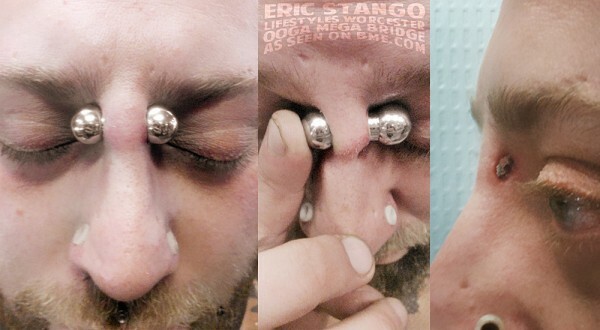 Depending on the anatomy of their skull, many people are lucky to be able to wear a 14ga barbell, and the bridge is not generally a piercing that is forgiving to stretching. 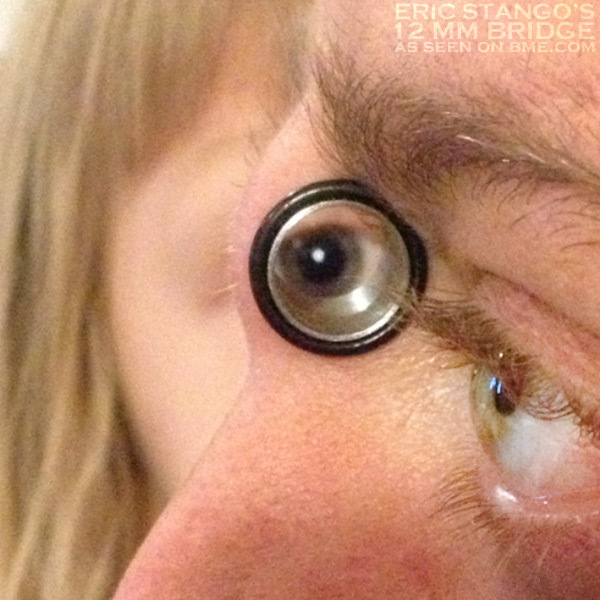 Eric though, has managed to get his up to 00ga (that’s what you’re seeing in this photo, which you can zoom in to for a closer view) — normally wearing a very hefty barbell in it — with the goal of pushing it to 1/2″. Here’s another one of those extremely, extremely rare ultra-unusual piercings that always make my day when I wake up to seeing them. 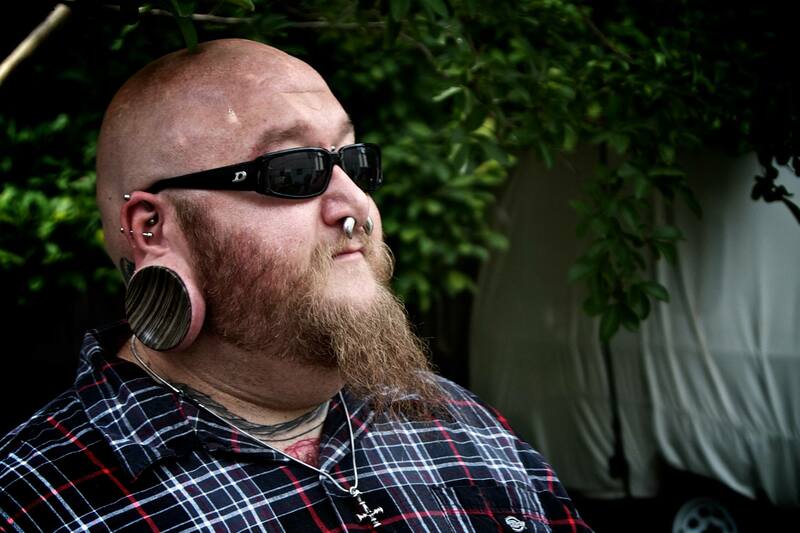 I can’t imagine how much force it must have taken to push the needle or punch through the big hunk of cartilage that makes up that portion of the nose — it’s a very imposing. The high nasallang piercing was done by Gabriele of Max Art in Italy (who I’m sure you know best from the SkinTunnel procedure), to accompany the existing nasallang and bridge piercings. Unfortunately it is unlikely that any more piercings between the bridge and the high nasallang could be done due to the anatomy, although they could be faked with microdermals. Raph looks fantastic in this portrait by Stella Morais. It’s an incredible shot that really showcases Raphael’s collection of modification, including the newly added cheek piercings. Look at those eyes. Seriously, how incredible are those? You know she wants to say something, but that ribbon is stopping her, so she only has her eyes to tell the story. Symmetry fans are going to love this, up until they see the nostril piercing, then all bets are off. Ladies and gentlemen, may I present, DefenzeMechanizm. And here’s a close-up of all those piercings she has. Email your submissions today! Simply send your photos to [email protected] and they’ll be automatically added to the image galleries. 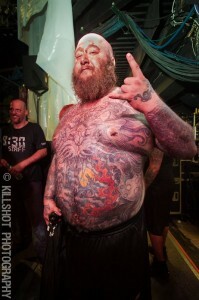 This is for all those symmetry fans out there. Well, provided you can overlook the nostril piercing only being on one side. This pair of 1 month old 14g (large-based) Anatometal dermal anchors was put in by Joeltron.